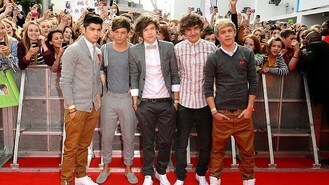 One Direction announced their first stadium tour yesterday - but many of their fans branded the news a disappointment. The boy band had been teasing a huge announcement for around a week, but when they finally opened up about what it was, many of their Twitter followers felt it fell a bit flat. X Factor manufactured group One Direction - who are currently on a world tour - held a press conference to say that they would be doing a stadium tour in 2014 that will end at Wembley Stadium. Niall Horan said: "We are ecstatic. We have only been a band for three years and we're already doing stadiums - including Wembley." Harry Styles said: "It's important the fans and everyone who comes to see the show know it's going to be much bigger and new songs. A completely different tour." But some fans were left feeling underwhelmed by the hyped up news, taking to Twitter with the hashtag #ONEBIGDISAPPOINTMENT. One tweeted: "the 'big announcement' that will 'change our lives' is another goddamn tour that I can't afford what a great news!!! #ONEBIGDISAPPOINTMENT" while another tweeted: "I lost sleep for this #ONEBIGDISAPPOINTMENT." International fans also had gripes with the tour schedule - one tweeted: "#ONEBIGDISAPPOINTMENT we waited for 6 days and then we suddenly knew that ASIA ISNT INCLUDED!" The Where We Are tour will begin on April 25, 2014 in Bogota, Colombia and end at Wembley Stadium on June 7. It will also take in Peru, Paraguay, Chile, Argentina, Uruguay, Brazil, Dublin, Sunderland, Manchester and Edinburgh, and tickets for the UK dates will go on sale on May 25 this year. Jamie Cullum is to perform a charity rooftop gig - with fans able to request the tunes he plays. Chart-topping songwriter Emeli Sande was a double winner at the Ivor Novello Awards. Noel Gallagher has said he would never "stoop" to co-write a song with another artist. Stooshe have entertained rush-hour commuters in central London with a live performance on a bus, to launch their debut album, London With The Lights On. Beyonce has announced she is cancelling a concert in Belgium because of dehydration and exhaustion. Singing star Susan Boyle has announced her first tour. Chris Brown has revealed his new single will feature rare vocals from the late singer Aaliyah. One Direction have announced plans for a stadium world tour in 2014.